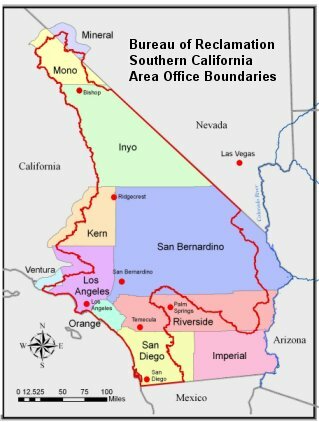 Reclamation's Southern California Area Office (SCAO) is located in Temecula, California, and encompasses all of southern California within the Lower Colorado Region with the exception of the Imperial, Coachella and Colorado River valleys. Situated in an arid desert climate without enough local fresh water to support the growing population and burgeoning economy, the area receives two-thirds of its needed water supplies from northern California (delivered via the 444-mile California Aqueduct), the Sierra Nevada Mountains (delivered by the 338-mile Los Angeles Aqueduct), and the Colorado River (delivered via the 242-mile Colorado River Aqueduct). Although the majority of water resources within SCAO's jurisdictional area goes to urban and agricultural uses, wide varieties of wildlife species thrive in Southern California's coastal and marine environments, sage scrub and chaparral habitats, and marshes and riparian zones. Valuable area wetlands including salt marshes and estuaries, freshwater marshes, riparian woodlands, and a number of reservoirs and lakes are essential resting stops for migrating birds on the Pacific Flyway and provide nesting areas for large numbers of wintering waterfowl. SCAO is responsible for administering programs to develop or enhance water conservation, reclamation and reuse projects throughout southern California, and its staff works cooperatively with several agencies. The office's planning assistance and Native American affairs programs also support various agencies' and tribes' efforts to improve their water management practices. For more information on these and other programs administered by Reclamation's Southern California Area Office, contact us at (951) 695-5310.